Shadowtime is a thought opera based on the work and life of the German philosopher, essayist, and cultural critic, Walter Benjamin. The libretto was written by Charles Bernstein for composer Brian Ferneyhough and had its premiere in May 2004 at the Munich Biennale, with subsequent productions at the Festival d’Automne in Paris, and the Lincoln Center Festival in New York. In its seven scenes, Shadowtime explores some of the major themes of Benjamin's work, including the intertwined natures of history, time, transience, timelessness, language, and melancholy; the possibilities for a transformational leftist politics; the interconnectivity of language, things, and cosmos; and the role of dialectical materiality, aura, interpretation, and translation in art. Beginning on the last evening of Benjamin's life, Shadowtime projects an alternative course for what happened on that fateful night. Opening onto a world of shades, of ghosts, of the dead, Shadowtime inhabits a period in human history in which the light flickered and then failed. Tess Crebbin in Music and Vision, says "Bernstein's libretto, plain and simple, is the finest contemporary libretto that I know of." [Walter] Benjamin is the "subject" of Charles Bernstein's Shadowtime (Green Integer), the libretto for Brian Ferneyhough's opera performed in London, and New York earlier this year. The complex interplay between the opera's words and its music is not always successful, but the libretto should be read as a remarkable poem in its own right — a superb "writing through" of Benjamin's own prose that shows an uncanny ability to grasp his critical ideas and stratagems, even as it turns them inside out. The result is a poignant — but also quite disillusioned and ironic — portrait of Benjamin, a victim, not only of his dark time but also of his own blindness. The new poetics ... is about to take on the aesthetic and ethos of the now finished twentieth century. It's an exhilarating moment to witness. Intrepid poets are showing a new interest in libretto-writing. 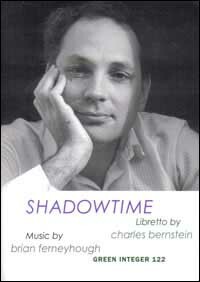 Charles Bernstein published "Shadowtime," his arrestingly fanciful contribution to Brian Ferneyhough's "thought opera" about the influential theorist Walter Benjamin. Anne Carson titled her new collection "Decreation" after a luminous feminist libretto she's written as a stand-alone text. Don Davis turned to Los Angeles poet Kate Gale, whose text was translated into Spanish for "Rio de Sangre." Weirdly, the Los Angeles Master Chorale translated her lines back into English for surtitles when it presented the opera-in-progress. Kafka, in discussing Georg Trakl's suicide during World War I, said of the poet, "He had too much imagination. So he could not endure the war, which rose above all from a monstrous lack of imagination." One could make the same claim about Walter Benjamin, who in 1940, believing he was about to be apprehended by the Nazis and interned in a concentration camp, took his own life. Beyond question, Benjamin was possessed of inordinate intellect and imagination and his work stands at the nexus of philosophy, critical theory, theology, and literature. His oeuvre amounts to a staggering productivity that often defies generic distinctions, a fact which has both helped and hurt its reception since his death. Such accomplishments are all the more admirable because he produced so much despite frequently negotiating bouts of severe depression, with no fixed professional position and living hand to mouth. Thus, Benjamin's life was constantly at the edge of crisis, physically, emotionally, and historically. Given its brief, tragic intensity, this thinker's life is ripe for operaand one, called Shadowtime, now exists, with a libretto by poet Charles Bernstein and music by Brian Ferneyhough. Fortunately, the libretto may also be read on its own terms. Present are all the ludic disruptions characteristic of Bernstein's work, and his attention to wordplay is as strong and surprising as everfrom transliterations to anagrammatic rearrangements of Benjamin's name (e.g. "I'm a lent barn Jew" (71)) to puns and paronomasias. But what is also present in the sequence is a kind of emotional intensity that isn't always present in Bernstein's poems. The poet's commitment, by turns political and philosophical and guided by a subtle and consistent intelligence, marks his essays and critical work, but his poetry, in working against conventions of lyric subjectivity to undercut the claims the lyric might make on authority, can often obscure the mechanisms and markers for discerning Bernstein's investment in his own poems.In Shadowtime, however, Bernstein's unsentimental yet passionate investment in Benjamin acutely raises the stakes of these poems. Set on the evening of his last day alive, Shadowtime's Benjamin is visited by phantoms (from Hölderlin to Groucho Marx) and phantasmagoria and he himself transforms into various voices and personae. This destabilized dramatic figure (and isn't the "I" always such?) works so well for Bernstein perhaps because the historical Benjamin provides an a priori cohesion for Shadowtime's explorations, which offer neither a mimetic portrait nor cohesive narrative. Rather than elegy, Shadowtime is an evocation. From the sequence's affective register, it becomes clear that Bernstein cares about his subject deeply, and the work belies surprising vulnerability and even intimacy; Bernstein's genius is to reconfigure that intimacy as a measure of one's relationship to language. Although one might suppose Benjamin's investment in historical materialism to be what draws Bernstein to him, it is the spiritual register of Benjamin's work that shapes and marks Shadowtime and makes it a masterwork. Gerhard Scholem, closer to Benjamin than almost anyone else, said of his friend, "There was about him an element of purity and absoluteness, a devotion to the spiritual like that of a scribe cast out into another world, who has set off in search of his scripture." It is this restlessness, this desire to commit to the world, neither blindly nor unreservedly but intensely, that Bernstein evokes in Shadowtime. As such, perhaps this collection reveals not only new ways of reading Benjamin, but new ways to re-read Bernstein's own body of work, his own restless, ethical inquiry. This review of the book and the performance is available online at http://jacketmagazine.com/28/browne-shadow.html. Charles Bernstein's Shadowtime and faithful interpretation by Joel Bettridge, Portland State University, Oregon (opens in new browser window).